I really don’t like soccer. Don’t really care for most team sports, actually, with soccer and volleyball being at the top of the list. When it comes right down to it, I just don’t like games. Call me curmudgeonly. I come from a serious sports playing game playing family, so I feel like I can say, I’ve played them and they don’t do much for me. Pat, on the other hand, is a big soccer fan. And couldn’t wait for Edie to play. Myself? I dreaded it. So did not want to be a soccer mom, nor did I really want to have to be around any. I don’t like competition on any level, but if I’m forced to compete……well, watch out. I’m going to win. Period. I realize that in order for my daughter to come to the conclusion she doesn’t like playing team sports, she has to try them out first. I was really hoping I could push her into basketball – I do like basketball and as she’s tall, I thought if we harness this, this is how we pay for college, right? (Always looking ahead I am….). Daddy, however, was really looking forward to those Saturday morning soccer matches. So, I swallowed my distaste and signed her up. Her first experience was pretty lousy. It took us another 2 years to coax her back out onto the field. I told her, she can’t say she doesn’t like it until she had more of an experience. So, we tried again. Another really horrible experience with the coach, but at least this time, she was able to see she liked playing the game and so agreed to give it one more chance. Because she’s tall for her age, I made the executive decision to ‘play her up’ to the U-10 level, even though she had another season at U-8. Here at U-8, they play half field and they don’t keep score. U-10, they play the entire field and keep score. I knew it could be a challenge at the start of the season, but I really thought she was up for it. And besides, there were kindergartners on some of the U-8 teams, there were some tiny little girls out there that really only came up to Edie’s knees, that she just kept running over and taking out without realizing or meaning to. She really needed to play with kids her own size. And she would be forced to develop skills quickly. Then, she could see if she liked it or not. When I signed her up, I requested a parent coach. (Part of the problem with her first two experiences had been with the coaches. High school and college kids as coaches just aren’t as invested, nor do they really understand the kids, you know?). We got her team assignment and she had a parent coach. Two of them actually. We were thrilled. The team was primarily made up with girls from a school across town, but we knew one of them because she had just transferred out of Edie’s school when her folks moved. So, we know someone! The only downside was practice was at their school, Fridays at 5. This was a clear violation of my happy hour enjoyment. Not only is motherhood making me a better person despite my objections, but this now it’s interfering with my drinking. I grumbled loudly to anyone who would listen. Posted it on facebook. Pat agreed to take her to practice, all the while slightly scolding me for being so petty and self centered. Of course I ignored him and one fine spring day, he came home from work early and realized it was the perfect kind of day that just demands a beer to be sipped on. Only guess who had to drive someone to soccer practice? I’m pretty sure he now understood my whining. Friday practice at 5 really is asking alot of us. He came home from that first practice pretty jazzed. The coaches seemed pretty laid back, the parents were all friendly. (Another part of our poor experiences was being on teams where we didn’t know any parents and none of them bothered to speak to us. All season. Go team!) . We had finally landed on a soccer team. That whole spring season, our girls played their hearts out. They were all playing up for the first time, so there was a group learning curve. They went all season without scoring one goal. Forget winning and losing, we were just trying to hold our own on the field. The beauty of it is though, it didn’t bother them. That season was a huge lesson in the old “It’s not whether you win or lose, it’s how you play the game” saying. They loved playing. At one point, Edie said to us, “I just don’t understand why they insist on keeping score.” It really didn’t matter to them that they didn’t win a game, or even score a goal. They just got out there and tried. Everyone came back together for the fall season. We had some girls drop off and some new ones join. Our goal at the start of the season was to score a goal. One goal. Which we did minutes into our first game of the season. We were ecstatic. We may have actually been some of the most obnoxious parents on the sidelines when we scored this season. Sitting an entire season without a goal will do that to you. Not only did we score goals, we won games. Sure, we lost a few too, but we really made some progress. One of the parents suggested we try the Frostbite Tournament at the end of the season. So, this weekend, despite snow and temps not creeping out of the 30’s, we spent the weekend sitting by the soccer field, cheering our girls on. We set up right by the side of the field, smack dab in the middle Saturday morning and stayed there. I realized later we monopolized the best seats most of the day. Oh well. We lost our first game and while we were waiting around for our next one, we had snacks galore for the girls. We marched them up to the snack bar and bought them all hot chocolate. While we were waiting for that, one of the girls lost a tooth and that became a team event. Right there, in front of the snack bar. By the time their second game rolled around, they were ready. They won that one, with a score of 6-1. They looked fantastic. They definitely were playing as a team and it was great to watch, especially knowing how far they’ve come. Those 6 goals were enough to give our girls a third seed in the next day’s games. There were only 7 teams, but still, our girls? Third? After an entire season of no goals? There was much joy and merriment and celebrating. We lost our game Sunday morning, we were all wiped out from celebrating together the night before I think. It was cold, we were whiny. And that was just the parents. The girls played like they were cold and tired too. After the game, we took the girls out for lunch and the parents had beers. We started planning next season and talking about when we need to play up to the next level. I realized I’ve become a soccer mom. As a friend pointed out to me, I’m just being a good mother and supporting my daughter. True. And I like her team. Turns out I’ve known half the parents some way or another for years. None of us take the game too seriously. As we were at the tournament this weekend, we noticed some of those parents are really into the game. We pay attention, but get distracted by our own conversations. And if they don’t win, no biggie. Life goes on. 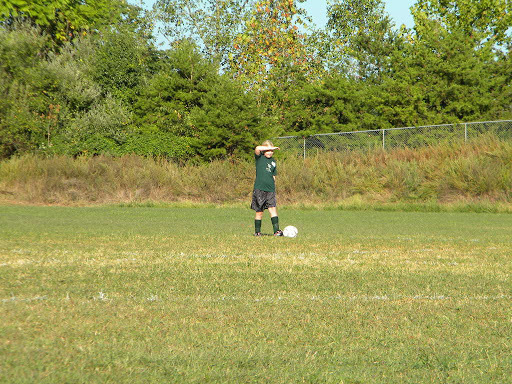 Edie really loves playing soccer. I tried to get her to play basketball this winter – some of the girls on her soccer team are playing and I thought it’d be great for her to play with them on some other sports. Then her father mentioned he got an email about indoor soccer this winter. Of course that’s what she wants to do. We signed her up to play with one of her neighborhood girlfriends. They are doing a little skills academy that hopefully will make her a better player come next spring. (Not that she’s not a good player, she’s just polishing those skills.) I was looking forward to getting my Friday nights back, but clearly the universe had other plans. We had our choice between Sunday mornings out at Western Albemarle or Friday nights at 6 in town. Guess which one we went for? Sigh. Not only am I having to feign an interest in soccer, I’m having to give up my Friday happy hours. Sometimes this motherhood business really is for the birds. In the grand scheme of things, I know this is a blip. Eventually she’ll move on, my luck to one of the travel teams where my entire weekend is taken up with traveling for soccer. If that’s what makes her happy though, so be it. Being a soccer mom isn’t as bad as I thought it would be. Turns out I’m not required to drive a mini-van, so I guess I can do this. A good team has made all the difference in the world, for all of us.